So what do we do with Steve Jobs? To have his companies caught up in the scandal raises the stakes for everybody. He is more than just a CEO, larger than his industry. Apple arguably has made the greatest cultural contribution of any of the great technology entrepreneurial endeavors that rose up in the late 20th century. Apple’s iPods and Pixar’s movies have risen to the level of art. So far, Mr. Jobs has been largely silent about the scandal, relegating his comments to press-release statements vetted by lawyers and public-relations professionals. That’s understandable: Apple is being sued over its options practices, and he doesn’t want to make himself more vulnerable. He also might be hesitant, understandably, to identify himself personally with the scandal. His silence is a mistake. 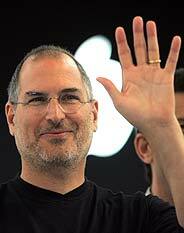 This is an opportunity for a great third act in a great career: This is a job for Mr. Jobs. You know what? I’m really sick of the Journal ragging on me. So I had my assistant take this picture of me (above). And here’s what I’d like you guys at the Journal to do. Squint real hard, and imagine the two fingers on the right disappearing. Then make the two on the left vanish. Then turn my hand around. Hey look, I’m waving to you!